Sometimes you want to make a recipe so badly that you dream about it. This is one of those recipes. It may be their vibrant golden color, but I just couldn’t wait to cook up these lentils and put them on every bowl and salad from here to eternity. And oh my did they deliver. Let’s do this! This dish comes together in about 20 minutes from start to finish, thanks to the quick cooking time of yellow lentils (which I’ve found to be very similar in texture and cooking time to red lentils). 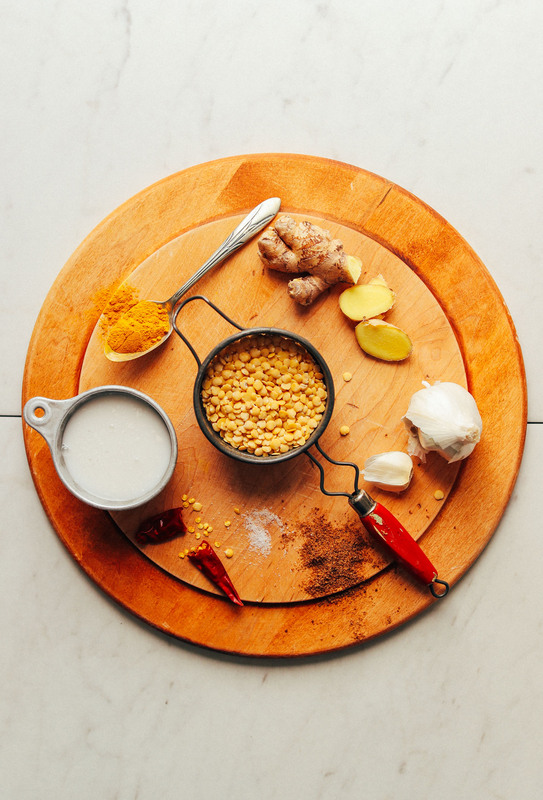 While you give your lentils a quick boil, prepare a coconut curry sauce with spices, ginger, garlic, and a healthy dose of coconut milk (check out my DIY Coconut Milk recipe). Once the sauce is seasoned, add your lentils and stir. Finish with a bit more seasonings and some fresh lemon juice and “POW” – you have beautiful curried golden lentils! These curried lentils would be delicious atop rice, cauliflower rice, salads, bowls, and more. I could also see them being a delicious part of a wrap or sandwich. And while delicious on their own, I think these would pair incredibly well with my Sweet Potato Cauliflower Curry, Avocado Sweet Potato Green Salad, Curried Butternut Squash Soup, Curried Beet Soup with Chickpeas, and our Vegan Naan. 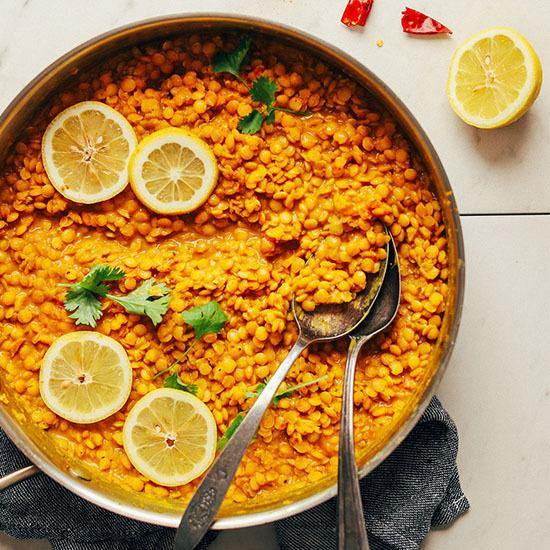 Simple, flavorful curried yellow lentils seasoned with fresh spices, garlic, ginger, and swimming in a curried coconut sauce. The perfect plant-based side! Bring water to a boil in a large pot or saucepan. Add lentils and bring back to a boil. Once boiling, reduce heat to a simmer and cook lentils uncovered for 4-5 minutes or until just tender. Then drain and set aside. Be careful not to overcook or they can become mushy (cooking time will vary by variety of lentil - check package for instructions). In the meantime, heat a large rimmed skillet over medium heat. Once hot, add oil or water, shallot (optional), garlic, and ginger. Sauté for 2-3 minutes, stirring frequently. Then add salt, curry powder, turmeric, and cayenne and cook for 1 minute more. Lower heat to low. Add coconut milk and coconut sugar (or maple syrup) and stir to combine. Cook over low heat for 3-4 minutes to combine the flavors (see photo). Add the (well) drained, cooked lentils (see photo) to the coconut sauce and stir. They will likely need more seasoning at this point. I added a bit more salt, curry powder, turmeric, cayenne, and coconut sugar because I like big flavor. But season to taste. Turn off heat, add lemon juice, and stir. Then serve and enjoy! These are delicious on their own, but they would also be tasty with rice, cauliflower rice, steamed or roasted vegetables, and more. *Method adapted from the talented Sprouted Kitchen. So glad to hear it! Thanks for sharing, Amanda! I made this, except I completed the recipe in a different order. I also didn’t have ginger, so I left it out. I basically cooked the shallot and the spices first and then added the water, coconut milk, and lentils. Came out great. My boyfriend loved it. It tasted like Thai curry to me (I used garam masala for the “curry”…so I’m not sure why that is). A little Thai basil on top took it to another level. My boyfriend wants me to make it again soon. Hi Anna, we think this recipe would blend well. However, we aren’t sure if it will be blended enough for post-operation eating- might want to double check with your doc on that part! Could you make and freeze this? Im looking for freezer meals for when baby 3 comes!! And this is a favorite of ours!! Congratulations on Baby #3, Jessica! This recipe can be frozen for up to 1 month! Easy to make and very flavorful! Great recipe! SUCH an AMAZING recipe! As a student on a budget with not a lot of time on my hands, this meal is perfect. Love meal prepping it with rice and enjoying all week. The lemon and ginger add amazing flavor. Thanks so much! Whoop! We’re so glad to hear that, Denise! I made this tonight and it turned out fantastic. Forgot fresh ginger so subbed some ground ginger. Paired it with cauliflower rice and slow roasted sweet potatoes and broccoli. Delicious! Do you have to add the sugar to the dish? This was ridiculously delicious!! It really tastes like a dish that took waaaay more time to prepare. I went with 1 Tbs of ginger and skipped the cayenne because my toddler can’t handle spice. I added half a Tbs of curry powder and 1 Tbs of lemon juice at the end to suit my taste. Regarding bitterness issue, I have read that overcooking the spices can make them taste bitter. I kept a timer and stuck to Dana’s suggested times and saw no bitterness. Hope this helps! Thanks for another easy-peasy and super delicious recipe! Since discovering it last year, your website has been my cookbook. Thanks! The curry powder and lemon juice I added at the end was in addition to the amounts listed in the recipe. Not sure! We don’t use an instant pot and can’t say for sure. If you experiment with this recipe, report back on how it goes! I made this yesterday and it was tooo delicious, I can’t wait for the leftovers tonight. The only change I made was substituting gochujang for cayenne. It was served it over cauliflower rice and steamed brussel sprouts. This will be a regular in my food repertoire. I made this (w/ red lentils) for my weekly lunch prep and it turned out delicious. Spicy and comforting, and so easy to make. I definitely anticipate making this regularly throughout the winter. Thanks for instructions for lentil cooking time. I’ve struggled with mushy red lentils in the past by using the package directions, which tell you to boil about 12 min. 4-5 min. resulted in a perfect al dente texture. Great! We are so glad you enjoyed this dish, Jenn! I made this for dinner tonight, and both my husband and I loved it. I added some steamed green beans and roasted cauliflower and served it over basmati rice. Since I didn’t have a shallot, I used a leek that needed to go and subbed red lentils. This recipe is a keeper! I just made this as a meal prep for lunch this week! I wanted something a bit more hearty, so I added a diced potato, diced butternut squash, and diced carrots, as well as lots of finely chopped sweet peppers! It tastes great and ended up coming out more like a thick stew, perfect for this fall weather <3 Thanks so much for this incredible recipe! Hey! I love this blog and I am a vegan. This recipe is actually very similar to a Sri Lankan staple dish called parippu! Most Indian versions of lentil curry usually use more ghee and other non-vegan ingredients! Sri Lankan cuisine is relatively more vegan friendly, as we use more coconut oil and coconut milk in place of butter, ghee, and milk! Smart! Thanks for sharing your wisdom! I just made this to have throughout the week as a quick and nourishing meal while i’m at college! I made the recipe with 1/2 diced small sweet onion instead of a shallot and added chopped carrots from the farmer’s market. Was going to add in some butternut squash cubes too but totally forgot. It turned out amazingly delicious and came together SO quickly. Having a bowl right now. Thank you for this lovely recipe!! O H MY these are the most delicious lentils I have ever made! I’ve had a bag of green lentil in my cupboard that I bought in a whim, with no idea what to do with them. So when I saw this recipe, I could not wait to try it. The flavor is all the warm and spicy sweet I was hoping to find! I swapped for the green lentils (cooked about 15 min, drained, and then covered in the pot while making the rest) then served over sautéed spinach and chopped sweet potato, with you’re cilantro chutney on top. I’m craving more of them just writing this post :) Sooo good! Oh, and I went Heavy in the spices too! This is now on our regualar meal lost. It is delightful and my daughter loves it too. Glad you enjoyed it, Eva! I have cooked this three times now and it is a favorite in my house! I substituted the coconut sugar for brown sugar and added sesame and chia seeds on top for extra fiber. So amazing! Love this recipe. This curry was so good, I could not believe it. The only thing I substituted was full fat coconut milk instead of lite coconut milk because it was all I had. My whole family loved it. I also make this sauce now for chicken instead of lentils. I just slice the chicken into thin bite sized pieces and saute it in olive oil for a bit and then add the rest of the curry ingredients. So delicious over brown rice. I made this tonight. Lentils needed cooking for longer. Followed the recipe and it was delicious! I made this with mung beans and instead of water I used vegetable broth. This recipe is very good that is the only change I would make to it. Use broth instead! It’s well worth it. Thanks for sharing your recipe changes, Michelle! We are glad you enjoyed it! This was very delicious. I did make a side of rice to go with it. It also made enough to have a delicious leftover lunch, which reheated well. When I make it next time, I think I will let the lentils boil for closer to 8-10 minutes– they were a tad firm, but otherwise this dish was amazing! Super easy. Added so much ginger and worried it would be too much but it was delish. My two toddlers loved it too. So quick and easy. I used almond milk and a can of lentils and the meal was so delish! I did however need to use cornstarch to thicekn up the almond milk though. I paired it with jasmine rice, sweet potato + herbs and soy sauce bok choy (It was leftover night!) Thanks for a yummy meal! Very hearty and great flavour, one of my favourites! Being a pretty new part-time vegan I had been looking for recipes to make (especially when busy). I’ve now made this twice (once with light coconut milk and once with regular) and it’s so delicious I’ve been trying to get other people to try the recipe. I’m really tempted to make it again already but know I need more variety. OMG literally to die for!! I have never been good at making curries before, but this is soooo amazing! I loved it so much I decided I had to leave a comment even though I never do. SO SO SO tasty! I am so glad I made it for our meal prep lunch for the week and that I get to enjoy this everyday of the week. LOVE IT! So delicious and easy. I love the layers of flavor in these lentils. I used red lentils as I had these on hand but didn’t precook then. Instead I added the lentils after the spices, sautéed them for one or two minutes and then added some vegetable brooth together with the coconut milk. I let everything cook until the lentils were tender, adding more brooth as needed. It didn’t turn out as creamy as I hoped so I used some tapioca starch for binding. It was perfect. I omitted the sugar as I didn’t find it necessary. Thanks for sharing! It sure wasn’t the last time I made this. Made these yesterday, used red lentils, added broccoli for additional color and texture, served over quinoa – sooooooooooooo good! Looking forward to reheating the rest today :). what GF lentils do you recommend? I was craving a curry dish so I whipped this up in NO time and it was great. Quick, easy, simple, but full of flavor. Thanks for the recipe! Sooooooo good, can’t stop eating it! Very easy to make and adjust flavour to preference. 5 stars! Recently vegan and cooking this for my family tonight. We love curries so hoping it is a hit. Serving with rice and leafy greens. Thanks for the free ebook too! Súper easy and delicious!! Love it ? Soooo delicious! I made to go with another MB dish & have a lot leftover. Will enjoy looking for places to use them! This recipe is wonderful!! I followed the recipe almost to a T and it’s quick, easy and just fantastic!! We like our food SPICY!! So I totally went for it with the spices. I used what was called for, then used the same spices for the lentils before I added them in, then added the same spices again after everything was combined. I used a lot of curry, a lot of cayenne and definitely got the desired result. I did use coconut oil. I did use full fat coconut milk. I did add “pure” maple syrup (good!). I did not have a shallot, but diced up a little bit of onion, as that’s all I had, just a tiny piece. I did add some chopped fresh broccoli and that was a good addition. Next time I will add onion and carrot and spinach (I was out of all 3). We don’t have lemons where I am, so I used a little bit of fresh mandarino juice (somewhere between lemon and lime). I will make this again and again. THANK YOU! One comment regarding lentils. I thought I had golden lentils in the cupboard. When I looked, I couldn’t decide what I had. They were sort of beige/light brown with some pinky ones in there and some maybe green ones in there. I looked online and saw photos of what I had, but they were not identified, but I did determine they were not yellow/golden, they were not red, nor green. I had the smaller red lentils on hand as well, so I used those. Just an EXCELLENT recipe! this looks good but I like a bit of crunch to go along with a recipe like this. what would you suggest? I didn’t have time to read through all of the comments but wouldn’t you be able to make this in reverse? That is saute the vegetables and curry powder and then add the lentils and water and cook? I would like to make this but it makes sense to do it in one pot if possible please advise as to why you chose to do it this way? Added to my above…the second time I made it I initially forgot the lemon…I added it after and what a POW of brightening to the flavors! Wow…first time I made it I thought I had died and gone to heaven- was gone in a short time! Second time I used what looked like golden lentils, but needed more cooking time. I added sauteed shitake shrooms & onions, doubled the spices and put in a large bag of baby spinach. I served it over white rice which is why I doubled the spices. So delish! It freezes and thaws like a champ! (its a little mushier after freezing, but to be honest, I liked it better that way. 5 stars and putting it into the regular rotation! Minimalist Baker…you are my hero! Love your site and what you do! Grew up in a very typical meat and potatoes kind of family so I never tried curry until I decided to make this one. OM goodness!! So much flavor! And so quick to make. Yum yum yum. Will become a staple in my household. Love it! Should we use sweetened or unsweetened coconut milk? I use sweetened and like it but my husband is saying it’s too sweet. Who knew!? Lemon juice in a curry. What a fancy, flavorful touch! I never would have guessed to add lemon juice, so I was blown away by how it just brightened everything up and tied it all together. Thank you for the recipe! It was delightful, easy and I’ll be adding lemon juice to everything now haha. Thank you! I made this tonight and it was earthy, warm, and simply divine. I used green lentils instead of golden lentils, so I bumped up the cooking time by about 5 minutes. As suggested, I added a bit more curry powder, salt, coconut sugar and cayenne pepper and it deepened the flavors even more. I’d definitely make this again! I’ve been thinking about making these for a week and today was the day! So delicious and so easy. I used red lentils and shortened the cooking time by just a few minutes. Thanks! Love your blog and appreciate your work. Omg these lentils are delicious! I make this once a week now and keep them for lunch. I have had lentils in my kitchen cupboard for years because I love them but never use them. Now I can barely keep them stocked! I have been making them with sweet potatoes and kale or over rice. Great job, Dana! I had the same problem a few reviewers had – horrible bitter aftertaste. I subbed split red lentils…wonder if that’s the issue? The bitterness is almost a spiciness, but I hadn’t added any cayenne yet. Puzzling. But I can’t seem to fix it by adding other stuff. I’ll try again with yellow lentils when I have them and see if I get better results. Holy cow! I was blown away with this recipe. So so delicious, as is everything I’ve made since following you!!! I used red lentils that I had on hand and cooked them for just as long as you recommended. You had also mentioned using stevia in replacement of coconut sugar or maple syrup (I had truvia) and used that as my sweetener to cut back on the overall sugar content, and it was divine. I want to bathe in this, or maybe add some more coconut milk and make it a soup? Hi Kelsey! I think you could add some more coconut milk to make it a soup, but wouldn’t recommend bathing in it ;) Glad you enjoyed it! How could you do this in a crock pot? My sister and i loved this recipe. I accidentally added more cayenne pepper and it was delicious. Thank you minimalist baker you are my go-to after changing my diet to plant-based. So easy my boyfriend was able to make it! And it was VERY good. Seems like a good recipe to play around with (adding different types of veggies, using chick peas instead of lentils, etc…). Will definitely be making this again!! Made this recipe tonight! DELICIOUS! Didn’t have turmeric so just added extra curry powder, and added 2 cups of coconut milk instead of 1 1/2. For how long could I store this in the fridge? Hi Cristal! It should last about 3-5 days in the fridge! Made this twice already since discovering it last week. I made this recipe a couple of weeks ago and it was amazing! So flavourful! I used red lentils since I couldn’t find yellow at the store and I added red pepper and zucchini. I’ll be making this again tonight! Looks so good! I’m currently trying to avoid adding sugar to my meals. Is there something you’d recommend to replace the sugar/syrup or do you think that omitting the sweetener would throw the recipe off? I looooooove your site. And have made so many of your recipes, so THANK YOU for all!! Question …. I’ve made this meal several times with yellow lentils. They always take at least 30 minutes to soften. What kind of lentils are you using that take 5 minutes? Best recipe I’ve tried from you yet and I’ve cooked many of them. They are all amazing but this curry is my favorite! SO easy but so tasty! Yet another amazing recipe! Five weeks as a vegan and your blog is my go to for inspiration and fantastic recipes that always turn out tasting and looking great. THANKS! So good. Was skeptical of the lemon juice, but it actually is perfect in this recipe. I just made this with rice and it turned out amazing! I took a shortcut and threw the lentils (I had red ones) in with the coconut milk and some extra water without cooking them first and tossed in some frozen kale too, and it worked perfectly. I’ll definitely make this again and I can’t wait to have some for lunch tomorrow, it’s so flavorful! Thank you! I made this today and I love it! I did find I had a bit too many lentils so I didn’t add them all in. Will def make this again! Sooooo good, seriously amazing. I will for sure put this on repeat. I made this tonight! First curry I’ve ever made. I used fresh turmeric instead of ground, scaled back the curry powder and did not add shallots or garlic since my wife can’t eat those foods. I also did not add all of the lentils – just gradually added until it was to our desired thickness. It was pretty much on point! I just read a comment above about using garam masala which I think we would like! I’m excited to have a base curry recipe I can adjust to use what we have on hand! My best advice is to add ingredients a bit at a time and taste along the way. We ate almost all of it! My wife had cauliflower rice and I had white rice – the cauliflower rice was best for flavor since our curry was less intense by chioce. Yum! Yummy! I just made this for lunch because I was lucky enough to already have all the ingredients. It’s so delicious. Thanks for sharing this! Made this tonight and it was very tasty! Lots of flavor, definitely include the shallot if you’re able to. Tossed in some thawed and squeezed frozen spinach at the end to get an extra boost of veggies and served with homemade naan. Question: how will this freeze? I portioned into mason jars and would love to toss one or two away for later if feasible. Hi Katie! We haven’t tried it, but if you do let us know how it turns out! I can report it was a success! Just made it exactly as posted. Just ate it. Mmmmmm. Served with sauteed kale cottage cheese and roasted chicken. I want to eat it all over again and I’m a real foodie. Bet it will be even better tomorrow. I skipped the cayenne in the cooking and put red pepper flakes on the table so everyone could add their own. The kale was really nice with it because of the different texture. I almost turned the lentils to mush. Will keep a better eye on them next time. Man they cook quickly! Ok… i’m really new to lentils. 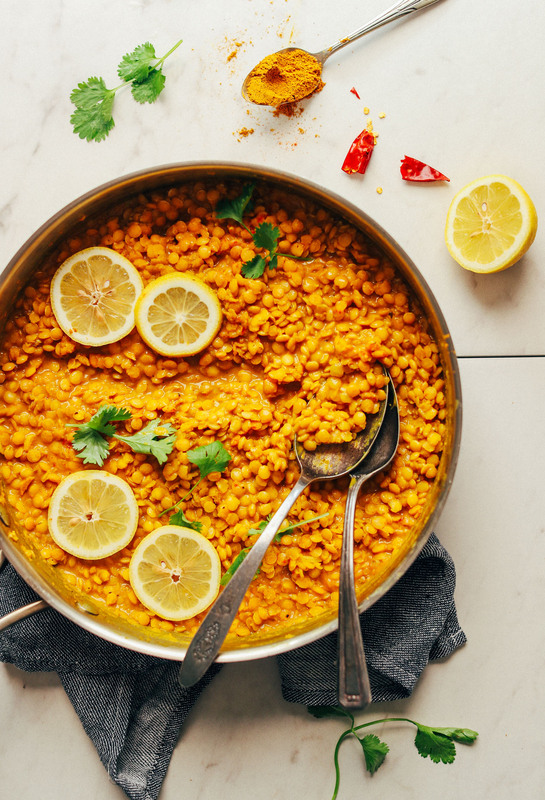 I still need to soak my yellow lentils prior to this recipe, correct? Hi Bekah! No need to soak the lentils, just rinse and drain them! Then follow step 1! Definitely the best curry I’ve ever made. Eternally grateful that I exist at the same time as you guys, life is certainly a lot more delicious! I threw this together last night, it came together so quickly and it was very delicious!! Thanks for another great dish, Dana! Just made this. QUICK, EASY, and AMAZING! I just moved to China so it’s hard to find a lot of the same ingredients that I cooked with back home. Thank you for making it easier for me by including simple/less ingredients :) Being vegan in China is HARD. This is super delicious. I used red lentils because that’s what I had and I used some chipotle powder for smokiness and heat and that was really good. Boyfriend is not super into eating meatless meals so I just added some protein on the side and ate it with naan – highly recommended! Made this and it tasted great ! Will definitely make again. The only extra was a big handful of chopped parsley. Wow, I made tonight and this is SO good! I added extra cayenne pepper as I love spicy. I paired with coconut curried greens which is also SO good. I used veggie broth since I did the beans in coconut milk. I paired with rice, potatoes, red and yellow peppers, sesame leaves, and chicken. Put this all in a bowl. Thanks for the recipes as I love to cook but normally don’t respond but it was so yummy I had too. Thanks and have a fantastic weekend. I have never commented on blogs, but I had to write you. WOW. I have tried a few of your recipes, and they are just simply marvelous!! 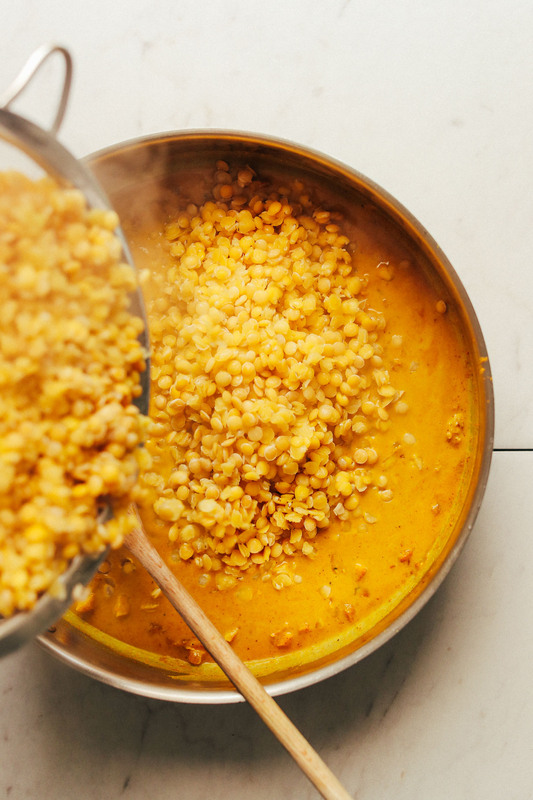 Just made your Coconut curried golden lentils, and it was so so so good. The best lentil dish I have ever tried. *in love with it. thank you so much for sharing your recipes, and the way you write, present and describe the food is just lovely. I used red lentils and it came out great!! Paired it with the roasted vegetable recipe, perfect!!!! Love all of your recipes! I feed them to non-vegetarians all the time to show them they’re not missing out on anything by giving up meat! Excellent recipe! I will be making again. SO FLAVOURFUL! This is absolutely scrumptious! We added carrots and green beans in as well for extra veg. Soo good!! I put more cayenne because I like a lot of heat. I also added raisins and peas. Served with roasted veg and rice. Will definitely be making this again! Excellent recipe! I made these for lunch today, though I subbed garam masala for the curry powder since I didn’t have any on hand. They are absolutely delicious. This might be kinda weird, but sometimes when I’m feeling down about blogging / recipe developing, I come to MB and look at all your awesome recipe ideas. Even just looking at these sunny pictures of golden lentils feeds my spirit!! 5 ⭐️ I made this last night , it was amazing!! I’ve made several lentil curries and this was the best recipe. Loved the addition of a little coconut sugar and lemon. This dish was earthy, warming , a little heat with a little sweet and creamy yumminess. Thank you Dana you recipes are so healthy for my body and soul. I used split red lentils from tj’s cooked for 12 minutes. Served over basmati rice with oven roasted sweet potato, potato, cauliflower and mushrooms. Also a some steamed spinach and TJ’s frozen garlic naan, yum! Made this tonight for dinner. Used several types of curry including hot and sweet curry powder. Added carrots, broccoli, sweet potatoes diced and cauliflower. It was absolutely amazing! I think that should work! Anyone used canned lentils for this recipe or not suggested? If you want you can try it! Let me know how it goes. Oh my goodness. 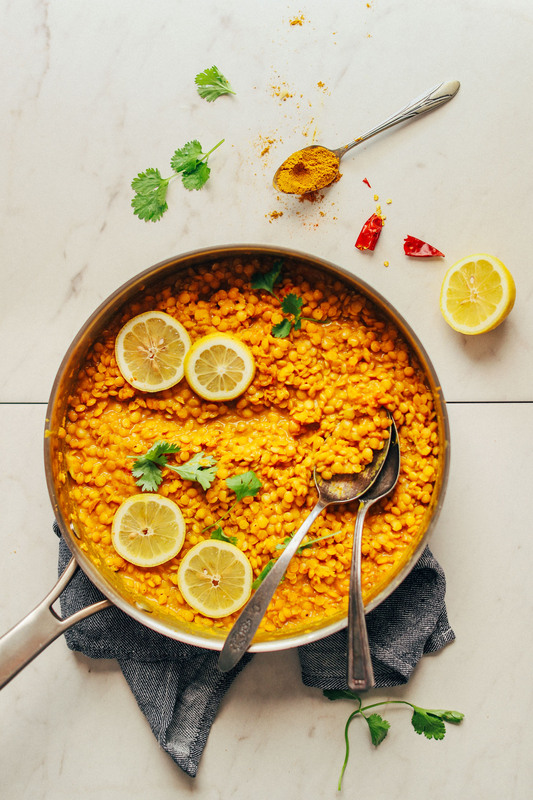 I absolutely love lentils, coconut and curry so this sounds absolutely amazing to me! I cant wait to try it! :) Thank you so sharing. Really quick and tasty. I added the slightly undercooked lentils to the spiced coconut broth and cooked them in it for a bit longer to absorb the flavours. Served without quinoa, spinach and black beans, delicious! This looks delicious and I’m looking forward to trying it. Just 2 questions: 1. what can I sub for the coconut sugar or stevia? I don’t have either. (Should I have coconut sugar in the house?) . 2. How would this be with roasted chicken thighs or grilled chicken thighs? Would I need a sauce? Oops, that’s more than 2 questions, but thanks for sharing your awesome recipes! You could use any sweetener really. Not sure how it would do with chicken! I made this last night with roasted veggies and spinach as a bowl. I followed the recipe almost exactly, except that I used red lentils since I had them on hand and didn’t use any sweetener (which I rarely find necessary). It was SO easy and really, really yummy! Thanks! Made this and it’s super!!!!!! Served with roasted curry cauliflower and baked sweet potato as well as naan. Thank you. Will definitely make again. Those lentils are only yellow at the end of cooking time but are almost pink before, but generally we call those red lentils, right? And I’m so going to make this this week! I think red lentils would work! They have a similar cooking time and texture to yellow. Green will take longer to cook. I used red lentils with this recipe. The texture was totally different than it looked in the photos. It was much more liquidy, like a particularly soupy daal. It’s possible this is due to using red lentils (I also suspect my cooking-novice boyfriend may have used too much water and cooked the lentil for too long). That being said, it tasted ~*amazing*~. I will definitely be making it again- just with less water while boiling the lentils. less coconut milk, and a more supervised cooking time for the lentils. I just prefer the texture of light. But full fat would work well, too! I made these tonight, they are absolutely delicious. I’m obsessed. Do you have any recommendations on what to serve or pair it with? Yes! Actually I have a bowl application coming later in the week! This was delicious and SO easy! Using all ingredients that we have on hand anyway. We used red lentils and paired it with some green beans. I’ll have it for lunch tomorrow with brown rice and greens. Was so excited to make and went to try a bit of sauce and it was amazing… and than bad! The turmeric has this strong bitter flavor that bites and takes away any good flavor. I had to triple everything to even it out. Is that normal? I just bought the turmeric today so it couldn’t be rancid? Hmm, that’s odd. Perhaps your turmeric powder was a bit stronger than mine? Unlikely but possible. Perhaps next time try scaling the turmeric back to 1/4 or 1/2 tsp at first and gradually building up! Turmeric shouldn’t be bitter. Is there a chance you burned the garlic? I sauteed just the shallot and ginger together for a couple minutes before putting the garlic in the pan, just to be sure it wouldn’t burn. I also ended up with terribly bitter lentils. Also, the ginger overpowers everything in my dish, even with extra curry powder and turmeric. I think the problem is the ginger. I’ve had one other recipe that came out similarly bitter and it was a carrot ginger soup with a TON of ginger. Perhaps I burned both dishes in the exact same way, but it would be odd that I’ve only had this issue with large amounts of ginger. I still love your recipes, Dana, but this one didn’t work for me. I also had lentils with a weird aftertaste. Kind of bitter/sour, and bland. I added more curry powder, salt, and cayenne, as suggested, and the flavor profile was better, but still with an unpleasant aftertaste. Definitely won’t make this again. Same here. I wonder why there’s a consistent theme of failure for a few of us, Weird! Maybe some packaged curry powders have something in them that causes bitterness? Yes, that was our error! That recipe is coming soon. xoxo! Made this tonight for dinner…super easy and delicious! I added a little extra cayenne after tasting, and mixed in some frozen spinach. This will definitely be in regular rotation!!! Great quick side! Flavirful, vegan yumminess. You’re a straight-up mind reader!!! I was just wanting to make something just like this and was about to do a “red lentil” search on MB. Perfect timing, can’t wait to make this!!! What do you think about adding veggies straight to the ‘daal’ like chopped carrots? Thanks for your amazing recipes! I think that would be lovely! Just add more coconut milk as needed so it isn’t too thick. I made this substitution too, and loved the less mushy, chewier texture. I soaked them first and then cooked for re. 35 minutes. I bought THIS brand at a local store. I forgot to leave stars! I can’t find them locally either. I was considering using an Indian lentil. Dal lentils cook to mush. Buy sm. yellow/red lentils. Can you use green lentils for this? Or would it change the flavor profile too much? It shouldn’t. However, green lentils seem to take longer to cook, so adjust the cooking time as needed! We made the raw carrot cake over Thanksgiving and thought it was wonderful but didn’t have too much success with the topping. Didn’t whip up very tall. I read this week that using different coconut milks whip up differently from others. Maybe a good mention, because this is very fun and is a refreshing dessert! Looks go good & beautiful! Fall all the way! I mean, looks so good!! Looks and sounds amazing! I love coconut milk and lentils so it’s a no brainer. BUT, the image that came with the newsletter looks absolutely delicious too. Which one is that one? ? I agree – Those veggies look amazing!! I think you meant to write 45 minutes for the lentil cooking time, rather than 4-5 minutes. Nope! 4-5. This type of lentil cooks very quickly. And then you continue cooking in the coconut milk mixture. You would only need 45 min for other types of lentils. Red & yellow take no time to cook! What could you use instead of coconut milk as my husband really doesn’t like coconut flavour? Oh he can taste the tiniest bit of coconut in ANYTHING!!! Wouldn’t be worth using it as he wouldn’t eat it lol! 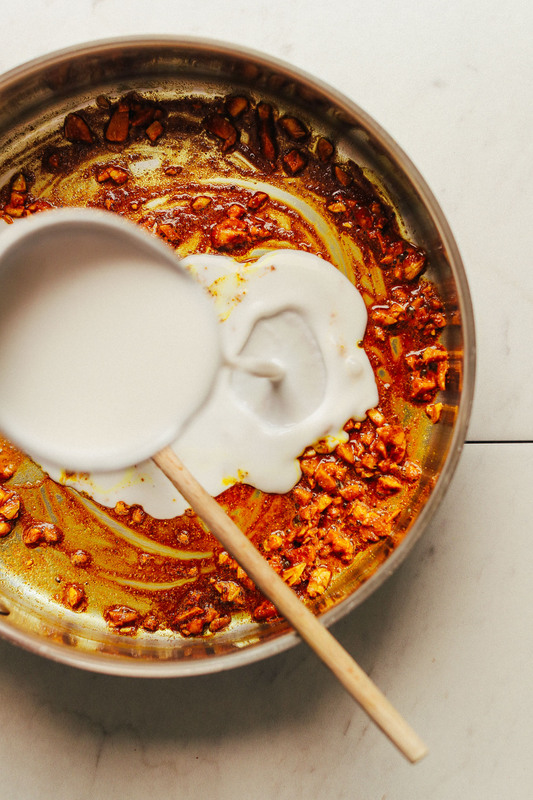 Cashew milk is super creamy, especially if you make your own (which is simple). You can control the creaminess by adding less water to make it more like cream and less like milk. I often use almond milk as a lower calorie sub for coconut. It doesn’t have the same consistency (not as rich/thick) but it still adds the necessary creaminess. Sometimes I will use a small amount of coconut milk and the rest almond milk. Recipe sounds great, I look forward to trying it! Alex – I’d say you could probably also sub almond or even better, rice milk! try watering down almond cream cheese (I like Kite Hill). That would work. I had my lentils on and onion/garlic mixture in the pan when I realized I had no coconut milk — or almond or rice milk or anything else even remotely milky. I chucked a stock cube in the lentils while they cooked, omitted the salt addition, and it turned out to be a delicious dish. Obviously, what I ended up with was not what this recipe makes BUT it makes a deliciously flavourful daal nonetheless. I have also made the recipe as written, and it is wonderful. The coconut is not overwhelming, but nicely complements the spice blend.